Last night, I hosted a Happier Hour Literary Salon with authors Priscilla Gilman and Sukey Forbes. The evening was, as expected, lively and inspiring and also incredibly moving. Priscilla read from and spoke about her memoir The Anti-Romantic Child; A Memoir of Unexpected Joyand Sukey read from and spoke from her memoir The Angel In My Pocket; A Story of Love, Loss, and Life After Deathand while the stories - both exquisite and important - are ultimately very different - Priscilla's book is about mothering her autistic son and Sukey's is about the loss of her six-year-old daughter and the aftermath of this loss - I was most struck - and inspired by - the true universalities that emerged, the strong emotional current that rose from the very honest dialogue and gripped all of us who were crammed into my yellow living room, whether we've faced similar experiences or not. I encourage all of you to read these books. Yes, they are gorgeously written, but it is more than that. Each is a wonderfully raw and real tale of grappling with something unexpected and remarkably difficult, of embracing life and self in the wake of an experience that was not chosen. What is amazing about both books (and I must stress again how different they are) is how uplifting they are despite their subject matter. Each contains a bright seed of optimism. Let's be clear: the sudden loss of a small child is very different than learning one's child has special needs. The former is an absolute nightmare, something Sukey said she wouldn't wish on her worst enemy and the latter, as Priscilla concedes, can end up being a remarkable gift. 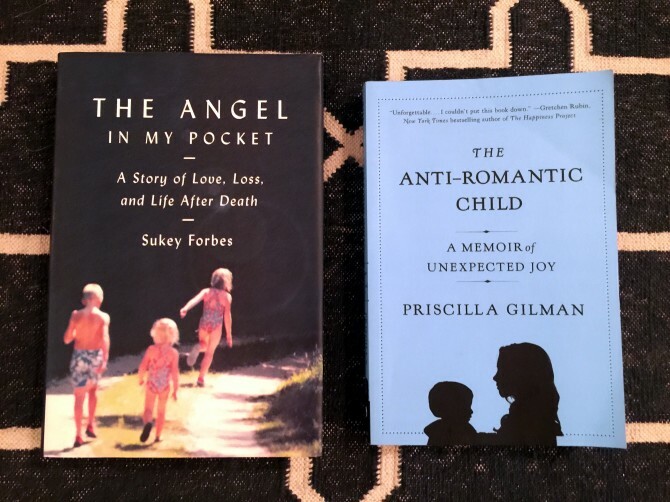 I had hesitations about pairing these authors, and these books, for this reason, but what I saw and what I celebrated last night was two women sitting side by side, opening up, being absolutely real, connecting with each other - and with all of us - over very human stories of struggle and survival. There was such a palpable warmth in the room, a sense of camaraderie that was truly magical. Both women spoke compellingly of the necessity of surrender, of giving oneself over to reality, of riding the air of life. Priscilla said her moment of surrender came when she stopped trying to catch her son up, to make him "normal" and finally accepted the fact that he will always struggle with certain things, that this will be his - and her - life. Sukey said that her moment of surrender came on the heels of a stretch of numbness, on a ski trip when she came unglued and sobbed through the night. I remember this scene from the book; it was tender and heartbreaking. Something Sukey said that I cannot stop thinking about... She said that at one point she realized that she had three choices: to die, to exist or to live. She confessed that after losing her daughter Charlotte, she had wanted to die, but she didn't get to. Instead, she spent some time simply existing in the world, but the real moment, and turning point, was when she decided she wanted to live. Goodness, do I find this powerful. And, as Sukey pointed out, it applies to all of us not just those of us who have faced devastation or had the proverbial rug pulled out from under us. I know I'm not the only one who fell asleep last night thinking about these choices, wondering: What does it mean and look like to exist and what does it mean and look like to really live? To accompany the rich discussion and yummy food, guests swilled delicious Domaine Barons De Rothschild [Lafite] Réserve Spéciale Bordeaux Blanc and Aruma Malbec from our friends at Pasternak Wine Imports and bought copies of both memoirs from Joshua, who came from my favorite neighborhood bookstore Book Culture (pictured below) to sell books during the course of the evening. I was thrilled that the books sold out and that Joshua left with just his empty crate! A few friends stayed late and my sister Ceara was here too, in town from Charleston, and we all stayed up and caught up and talked about how powerful the night was, how phenomenal the authors were. When everyone scattered, in an old school move, Ceara and I ducked out for some late night food, plopping ourselves at 11pm at a neighborhood ale house during the World Series Game. We sat at a little table and ate French onion soup and quesadillas and talked and talked, Mets fans getting rowdy and riled around us. It was pretty cool and special and I realized how much I miss her and wish she still lived here. I woke up this morning foggy from too much good wine (hello, broken record ADR) and too little sleep, but I was kind of floating anyway. Because I thought back to last night and how beautiful it was, how raw and real and amazing. I got out of bed and poured my first of several coffees and hugged my sweet girls and got them dressed and felt a wild blaze of gratitude and love for them and for this life I vow not to take for granted. Husband and I put the big girls on the school bus and then I took my tiniest babe to school and we stopped for donuts just because. I am so grateful to Priscilla and Sukey for coming here, for bravely and beautifully sharing their stories with all of us, for being such brilliant examples of what it means to be graceful and strong in a world that is often so unpredictable and unfair. It's an honor to know these women, to call them colleagues and now friends. And I'm grateful to all of the women who pressed pause on busy lives to be here with me last night and to all of you who are here reading my rambling but felt words and examining life and love and books alongside me. Happy Wednesday, guys. To learn more about my Happier Hours Literary Salons and opportunities to sponsor or attend, visit our website.